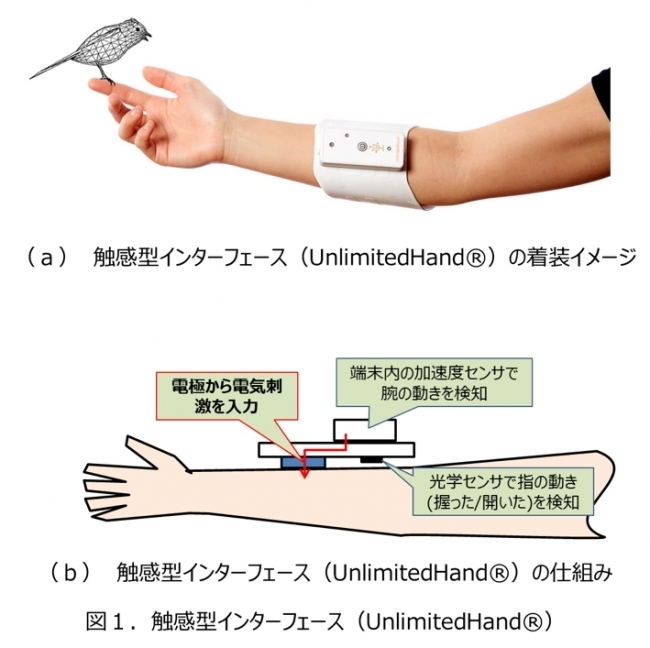 With the aim of providing new haptic experiences, H2L inc. (CEO: Kenichiro Iwasaki, Headquarters: Koto-ku, Tokyo, hereinafter H2L) and Nippon Telegraph and Telephone Corporation (CEO: Hiroo Unoura, Headquaters: Chiyoda-ku, Tokyo, hereinafter NTT) have developed an interface that allows the sharing of haptic experiences within VR and AR environments by combining the use of their respective technologies: Finger Motion Capture and Electrical Muscle Stimulus Control owned by H2L, and the appraised hitoe® owned by NTT. H2L has been manufacturing and selling UnlimitedHand®, a wearable device that simulates the sense of touch within virtual environments which can be felt though the wearer’s own hand. It has been marketed as a development tool for game creators featuring two key technologies Finger Motion Capture and Electrical Muscle Stimulus Control. Finger Motion Capture is a hand and finger motion tracking system that collects input for VR gaming. 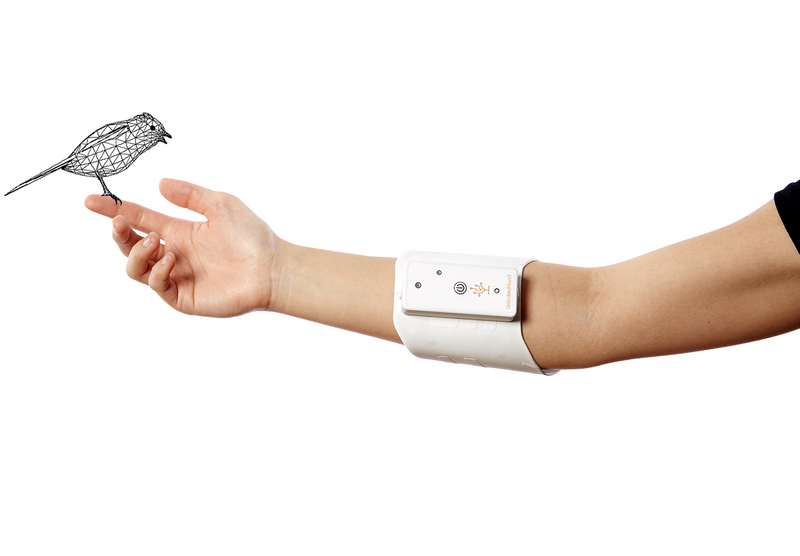 It consists of integrated motion sensors and a muscle motion sensor array overlaid around the wearer’s forearm. Electrical Muscle Stimulation Control simulates virtual haptic feedback through applying functional electrical stimulus to artificially contract the wearer’s forearm muscles. The current model of UnlimitedHand® uses hydro gel pads commonly found in other EMS products to provide necessary resistance between human skin and electrodes. Several inconveniences have prevented H2L from bringing full satisfaction to customers. This includes uneasiness brought about by the stickiness of the pads, the tendency for pads to harden as moisture depletes which lowers the effectiveness of the stimulus, and hygienic concerns due to difficulties in cleaning the device. NTT together with Toray Industries (2-1-1, Nihonbashi-Muromachi, Chuo-ku, Tokyo, CEO: Akihiro Nikkaku) have collaborated to develop the functional material hitoe®. NTT is in chargef the electrical evaluation for this material as it is being tested as a replacement for the hydro test pads used on the UnlimitedHand®. After implementing hitoe® on UnlimitedHand®, H2L have managed to solved the problems brought about by conventional gel pads. The product can now be worn repeatedly without losing its effectiveness. Being capable of being washed for 100 times, hygienic concerns too are improved. As a result, customer satisfaction can now be provided. In addition, hitoe® has solved the problem of stimulus inconsistency caused by individual differences in skin types when using gel pads, dramatically increasing the performance of haptic feedback. Due to these improvements, we have overcome one of the main obstacles to commercialize a product that has been marketed at a niche user group of specialist developers. 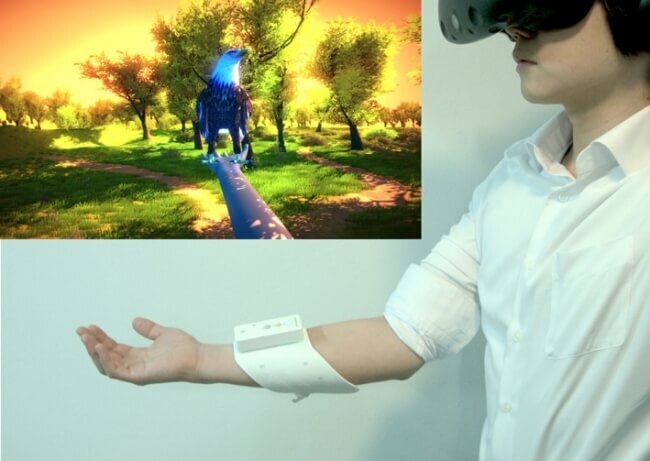 From now on, H2L will shift from marketing UnlimitedHand® as a personal game development tool to tying up with VR theme parks and collaborating with entertainment companies to accelerate the promotion of the device. On 9th January 2018, at the Consumer Electronics Show 2018 (CES2018) Sands Expo Level 1, Hall G #53359, H2L has exhibited UnlimitedHand® with hitoe® implementation to showcase the potential applications in this field. We plan to base our product development and sales plan upon feedback collected from demonstrations. EMS (Electrical Muscle Stimulation): A method of strength training that works by applying electrical pulses to targeted muscles to generate artificial movement. VR (Virtual Reality): A system or technique used to engineer fabricated environments that possess the same qualities and functions as our physical environment by simulating the five senses of the user. AR (Augmented Reality): A word used to describe technology that extends and/or expands our perception of the real environment through computer processes. Established July 2012. The company researches and develops products that enable the remote broadcasting of touch sensations. Flagship products consist of PossessedHand® selected by TIME (US) to be listed as “2011’s top 50 inventions”, haptic game controller UnlimitedHand® and the smartphone compatible gesture control set FirstVR®. The company focuses on developing their two key technologies: hand and finger motion capture and multi-electrode electrical stimulus control system.